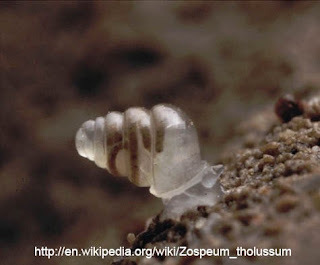 Zospeum tholussum is a recently discovered (2010) European snail which is sometomes called the Croatian cave snail. The snail was found in one of the deepest cave systems in the world at a depth of 980 m. Since the fisrt several shells were collected at depths of up to 1390 m. They have several adaptations whoch often occur in cave dwelling animals which never see the light. 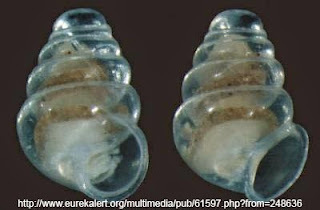 They are transparent, they are completely blind and apparently they are even less mobile than most snails. These little snails are only known in the Lukina jama–Trojama cave system in Croatia.